It’s Friday night and Yoshi’s is packed. 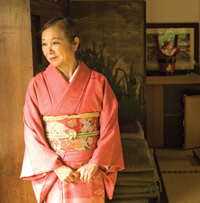 But the renowned jazz club’s namesake, Yoshie Akiba, is as cool as a cocktail on a grand piano. A dancer, painter and businesswoman extraordinaire, Akiba finds balance and energy in some surprising ways. This place is a pressure cooker. How do you stay so calm? Isn’t it amazing? I’m a World War II orphan. Everyone [in my family] was killed, except me. Yet, I’m so—happy. But it wasn’t like that from the beginning. I think I was guided by spirits, and I was very lucky. Did the hardships you had as a child pave the way for your success? When I think about it, growing up, I was always exposed to music and dance. After the war we had very little food, but we lived near an army base, and the people there used to help us, so to entertain them I learned songs and improvised dance. That way they would give me chocolate, chewing gum and candy. You’ve come a long way. How do you keep your cultural connections? My backyard in Rockridge has a traditional Japanese Zen temple. Every morning, I get up and meditate. Then I chant. Forty minutes each. It really makes me very clear and it cleans me and helps me see myself. Your yard reminds me of the Japanese Tea Garden in Golden Gate Park. In fact, tea is a part of your daily ritual, too. Right? Our culture is strongly connected with tea. It’s like a bridge between the material world and the spiritual world. I teach Japanese tea ceremonies in my house that are open to the public. Green tea sounds a lot better for you than sake. But you must have some vices. I do gamble. I play the dice and sometimes blackjack at Harrah’s in Reno. I like it because it’s fun and it’s living in the moment. How about your husband? I understand he’s a high-level Buddhist priest and you’re, well, such a social person. Does your lifestyle work with his? Interesting question. We compromise. I like to meditate and I like Zen Buddhism. So when we get together, we kind of remove ourselves from the real world. But we like to take people around when they come from Japan. You know, to the wine country. We also like nature, so we often go to the ocean. Was the proximity to the water one of the reasons you picked Jack London Square for the location of your restaurant/jazz club when you moved it from Claremont Avenue? Yes. But I also like Jack London. I’ve read many of his books and I really like his spirit. And I wanted to help Oakland. I think they really needed a place like this. What do you tell other club owners when they ask how you made Yoshi’s so successful? You have to love it and work hard and be really genuine. I have 130 people working for me. If I’m not a very good person, people won’t follow me.